Having perfectly clean and well equipped washroom in any New Zealand workplace is an imperative. Clean and odour-free washroom ensures comfortable and pleasant working experience for your employees. It keeps the working environment sanitary and hygienic. Fresh and clean washroom also leave an excellent impression on all clients, customers and potential business partners that visit your workplace. Also, caring about the condition of your washroom means you care about the health and well-being of your employees. Alsco can help you keep your washroom maintained with the highest standards of cleanliness and hygiene. Moreover, it will be done in a smart and environmentally friendly manner. You can stop thinking about how much soap you have or if your washroom has an unpleasant odour. That’s all on Alsco now. Our knowledgeable and skilled employees will regularly replenish all the consumables from your washroom and, if you choose that option: deep clean all your toilets and showers. The state of your workplace washrooms can speak volumes about the way you run your business. It also shows how much you care about the health and well-being of your employees. It takes time to take care of workplace washrooms and keep them up to high standards. Alsco does it best and never forgets anything, so delegate that duty to us. Clean hands are your first line of defence against spreading diseases in your workplace. That’s why Alsco offers services that enable your employees to thoroughly clean and sanitise their hands. Explore our soap dispensers and hand sanitisers and help us tailor our services to your business needs. Alsco’s hand drying options are designed with workplace safety in mind – they efficiently prevent the spread of bacteria while providing pleasant and convenient hand drying experience. 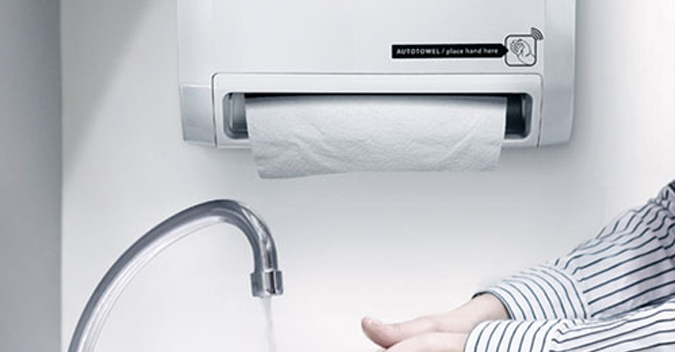 Choose from traditional cloth towel dispensers (invented by Alsco), or super-fast drying jet dryers. Of course, wall-mounted paper towel dispensers are also an option. The way your workplace smells has a big impact on both your clients and your coworkers. To ensure constant and pleasant air aroma, contact Alsco and discuss our Odour Control Services. While Alsco Sanitisers ensure unpleasant odours are kept at bay, the Air Fresheners disperse pleasant scents of your choice on regular intervals. When regular cleaning just doesn’t cut it, Alsco has a different option for you. Even if you regularly clean your workplace washrooms, there is always a bit that you miss. In time, bit by bit, your washroom doesn’t look nice and clean. Alsco Deep Cleaning Service reverses the clock for your washroom, cleaning it to the very last detail. Many people spend more time in the office than at home, so it is vital to practice good hygiene in the workplace. You can help prevent your colleagues from being unwell. Along with our aim to help New Zealand create a healthier, safer and greener workplace, Fresh & Clean provide helpful hygiene resources for every workplace.